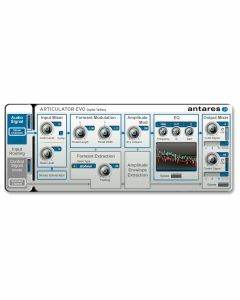 Antares' ARTICULATOR EVO is a modern day version of the talk box that lets you extract the formant and amplitude information from a vocal line and apply it to any other audio track. It lets you create talking guitars, singing synths, whispering voices, or a wide range of special effects. Perfect for talking guitars, singing synths, and a wide range of special effects, ARTICULATOR EVO is a modern digital version of the venerable talk box. If you've ever seen a guitarist with a plastic tube in their mouth and a guitar that sounds like it's talking, then you have a basic idea of what a talk box is. A physical talk box works by applying a filter (the human mouth) to an audio signal (usually a guitar or synth). ARTICULATOR EVO models this process by extracting the formant and amplitude information from a vocal track and applying it to another audio track or to a built-in noise generator in real time. ARTICULATOR EVO also features a built-in EQ, a Formant Modulation section, which allows you to sculpt your vocal characteristics using our throat modeling technology, and an Amplitude Modulation control, which lets you dial in exactly how strong you want the modulation effect to be. Designed to use a vocal track to control the processing of a second track, ideally a track with broadband harmonic content like a rich synth patch, a processed guitar, or the built-in noise generator. ARTICULATOR EVO requires an iLok (not included). Pro Tools 7.x - 10.x.